The conditioned have improved such that the drought was officially declared over on May 18, 2017. The long-term prediction is for average rainfall for the next 12 months. Below are the links to the latest conditions and predictions. 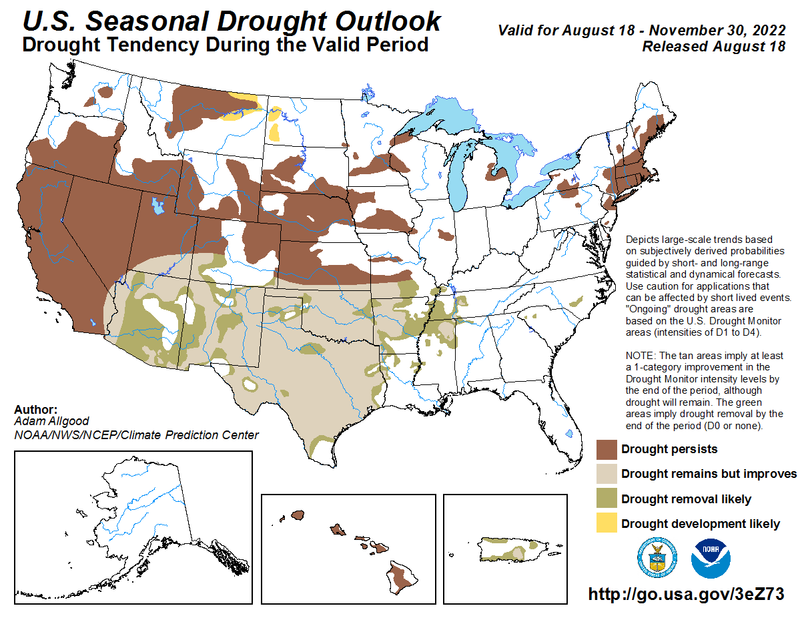 Below are links to the latest drought conditions and predictions. The U.S. Seasonal Drought Outlook, valid March 16 through June 30, is predicting that drought removal is likely. The U.S. Drought Monitor for Massachusetts released March 28 states that we are still in a moderate drought. The Massachusetts DEP Drought Status states that we are in a drought advisory. Based on Stony Book and Fresh Pond Reservoir levels and continued average rainfall, CWD continues to run without using MWRA water and are optimistic that we can continue to run this way through June. As a result of continued rainfall each month since October 2016, we have been able to significantly reduce the need to use MWRA water. We have not purchased any MWRA water since December 12, 2016 and if “average” rainfall continues this could continue for several months. The U.S. Seasonal Drought Outlook predicts that the “drought remains but improves” through April 2017, another slight improvement from last month. We will need 9-12 inches of rain over about a month to get out of the current drought. We continue to strongly encourage water conservation and to expand our water conservation outreach. As a result of the December rainfall, CWD continues to reduce the projected amount of MWRA water introduced into the Cambridge system. The U.S. Seasonal Drought Outlook predicts that we are on the borderline between the drought persists/drought remains but improves through March 2017, a slight improvement. The long range drought prediction has not changed. CWD will continue to look to minimize MWRA water use to maintain the reservoir system, and keep our water plant operational. As a result of the November rainfall, CWD continues to reduce the projected amount of MWRA water introduced into the Cambridge system. The U.S. Seasonal Drought Outlook predicts the drought will persist through February 2017 for New England. The long range drought prediction has slightly improved through 2017. CWD will continue to look to minimize MWRA water use to maintain the reservoir system, and keep our water plant operational. As a result of the October rainfall, CWD has been able to reduce the projected amount of MWRA water introduced into the Cambridge system since early last week. CWD will continue to look to minimize MWRA water use to maintain the reservoir system, and keep our water plant operational. The Cambridge Water Department (CWD) carefully monitors the City’s water supply system on a weekly basis to ensure an adequate supply of water is available to meet the needs of our residents, businesses, and universities. As the severity of the drought in Massachusetts continues, the usable capacity remaining in our reservoir system has been declining due to insufficient rainfall. However, Cambridge is not at risk of running out of water because in addition to our own water supply, we are a member of the Massachusetts Water Resources Authority (MWRA) system, which is operating at normal conditions for this time of year. Based on the current reservoir levels and the need to maintain the operability of the water treatment plant, CWD will begin introducing MWRA water into Cambridge’s system starting Tuesday, October 11th. This approach will allow CWD to maintain enough water in our reservoirs to allow the water treatment plant to continue operating at 10 MG per week through the fall of 2017 when the current weather predictions indicate that the drought will end. In addition to purchasing water, CWD is expanding conservation efforts with top users and universities and will continue to strongly encourage the practice of indoor and outdoor water conservation wherever possible. This September the City reduced its irrigation usage by about 50% and is looking to turn off irrigation systems earlier than normal. While additional conservation efforts are an important tool for all users of our water system to participate in, Cambridge’s robust water conservation/water efficiency programs over the past two decades have resulted in Cambridge users using significantly less water per user than other communities in the Commonwealth and will make this more challenging to find significant usage savings. Because of the significant cost increases that the CWD will incur by purchasing water from the MWRA, there will be future financial impacts to the City. Moving forward, the CWD will look to minimize MWRA water use, continue to maintain the reservoir system, and keep our water plant operational. Call 617-349-4737 or email us to request a Leak Detection Kit. I'd like to: Select one Pay My Water Bill Tour Opportunities Water Service Issues Fresh Pond Reservation Apply for a Permit Get a Permit for Fresh Pond Test My Water Where Does Our Drinking Water Come From?